The David Roche Collection is honoured to have a significant portrait by leading Italian Grand Tour artist, Pompeo Batoni, for extended exhibition. On loan from a private collection, Portrait of Thomas Dawson (1725-1813), later First Viscount Cremorne, c.1749-1752 is being exhibited in Australia for the first time and represents the earliest period of Batoni’s portraiture. 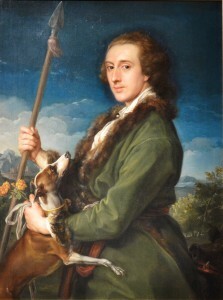 Thomas Dawson is painted three-quarter length, in a green fur-trimmed coat with a fur collar, holding a spear and a dog with his other hand, a boar’s head to the right. The young Dawson was in Rome between 1749 and 1752 as part of his Grand Tour of Italy and commissioned his portrait from Batoni. A number of aristocratic Irishmen were amongst Batoni’s earliest clients and likely they introduced Dawson to the artist. Stylistically, the portrait is similar to those painted of Matthew Fetherstonhaugh, First Bt, 1751, and Benjamin Lethieullier, 1752, both at Uppark House in West Sussex, England. Like Dawson, they were presented as a hunter of old, with archaic boar spear, a hunt dog and fashionable clothing. Some art historians theorise that the accoutrements link the sitter to Endymion, an Ancient Greek shepherd and hunter. Batoni’s enduring popularity lay in his classicising of his sitters, often placing them within semi-natural settings featuring Roman antiquities. Neoclassicism reached its zenith during Batoni’s career and he painted over 150 aristocratic Englishmen and women as well as European nobility and royalty and even three popes. David Roche knew the work of Batoni well and the portrait of Thomas Dawson would have appealed to him immensely. A young, fashionable man, with a steady gaze and a dog eager to do his master’s bidding, Batoni’s painting fits perfectly into the surrounds and collection developed by David. We are thrilled to present this rarely seen Batoni painting, which is looking particularly splendid after recent conservation. Image caption: Pompeo Girolamo Batoni (Italy 1708-1787), Portrait of Thomas Dawson (1725-1813), later First Viscount Cremorne, c.1749-1752, Italy, oil on canvas, 119.5 x 96.0 x 6.5 cm, signed indistinctly to spearhead ‘PB’; On loan from a Private Collection.